Rupert Murdoch and News Corporation are heading for another major scandal regarding bribing government officials and this time it is in Australia and involves NSW Crown Prosecutor Margaret Cunneen. Murdoch’s News Corp has a long history of bribing government employees for stories. This was exposed by the UK phone-hacking scandal which also revealed the bribing of UK police and other officials. The Australian bribery scandal is being exposed as the UK phone-hacking scandal, which has run for about 4 years, is coming to a close although some of the victims are demanding it continues. Below is a video of News Corp executive Rebekah Brooks admitting paying police for stories which is a crime. So the question has to be asked has News Corp also been paying Crown Prosecutor Margaret Cunneen for stories which is also a crime? What has motivated Margaret Cunneen to commit the crime? In the video Rebekah Brooks then known as Rebekah Wade openly admitted to paying police for information. This was in front of a British Parliament select committee in March, 2003. The person sitting beside her, Andy Coulson, interjected and quickly tried to cover it up. It must be noted that there is no way to pay the police within the law. It is bribery full stop. Andy Coulson was clearly lying. The video is from a previous article I wrote in June 2014 titled “Will Rupert Murdoch and News Corp face charges for breaching Australian International Bribery laws?” which is of relevance again now given the Margaret Cunneen revelations. That probably would have been the end of it but there has been a massive push by Margaret Cunneen, her supporters in the legal fraternity and News Corp to have ICAC Commissioner Megan Latham removed. One of Cunneen’s biggest supporters has been ICAC Inspector David Levine who has oversight of ICAC. Last week Mr Levine handed down a report which seemed to shoot everyone in the foot except it’s intended targets of Megan Latham and ICAC. The biggest story in the report has been the fact that Margaret Cunneen has been abusing her position as a Crown Prosecutor and illegally leaking stories to the media. The media have by and large ignored it or only mentioned it to a minor degree. I have written about the ICAC/Cunneen matter in 4 other posts which are worth reading for a background to this story. In December 2014 (Click here), April 2015 (Click here), May 21st 2015 (Click here) and May 27th 2015 (Click here). Levine’s report is openly biased in favour of Cunneen but who cares as it is also extremely explosive because of what it says regarding journalists and Cunneen’s leaking to them. Levine’s best days are obviously behind him because he has helped destroy his friend Cunneen. It is a criminal offence for a prosecutor to leak information about a trial to anyone including journalists. The named journalists would be extremely worried about being named and are clearly the ones (or their friends) who are attacking ICAC and Commissioner Margaret Latham. I wonder how many other names The Daily Telegraph has deliberately left out. Jason Morrison is only new at Kerry Stokes’ Channel 7 but 7 have been vocal supporters of Margaret Cunneen and they have done exclusive interviews with her recently which suggests she has been leaking to 7 as well. I suspect there are more journalists than just 2 as Cunneen gets a lot of favourable coverage from numerous News Corp journalists. The police should be asking how many senior managers at New Corp knew that Janet Fife-Yeomans and others were getting tips from Margaret Cunneen and did they pay Cunneen? A bribe doesn’t have to be money. It can be anything such as favourable media reports which Cunneen has received over the years and especially recently when the media should have ended her career given her corrupt conduct but certain journalists have spread lies on her behalf in an attempt to support her. The journalists are paying Cunneen for her leaked stories with favourable media reports which would constitute a bribe although cash being paid to Cunneen is also is a strong possibility given News Corp paid UK police. The key journalist at News Corp who is driving the attack on ICAC and Latham is The Australian’s Legal Affairs Editor Chris Merritt. Mr Merritt has been the everywhere man attacking ICAC. In April Mr Merritt joined Alan Jones to attack ICAC. Alan Jones interviewed The Australian newspaper’s Legal Affairs editor Chris Merritt a couple of days after the High Court handed down it’s judgment in the Margaret Cunneen / ICAC matter. They went hard attacking ICAC and defending Margaret Cunneen. In the tape you will hear Alan Jones refer to journalist Janet Fife-Yeomans as a source who we now know is one of the beneficiaries from Margaret Cunneen’s leaks. Margaret Cunneen has told a lot of lies about what did and did happen and many of those lies have been exposed in recent days. The biggest lie is that Margaret Cunneen says she has fought so hard this time because it involves her family and she was trying to protect them. We know this is lie because Ms Cunneen tried to blame her sister for complaining to ICAC and initiating the investigation. The reality is that the Australian Crime Commission referred evidence to ICAC which sparked the Operation Hale investigation into Cunneen. Margaret Cunneen has never apologised to her sister nor have the journalists that know about it and they still ignore it when defending Cunneen. What the evidence from Cunneen’s mobile phone does not show is other times that Margaret Cunneen has tipped off journalists and what other journalists have been beneficiaries to Margaret Cunneen’s inside information. Two of the obvious people are 2GB’s Alan Jones and Ray Hadley who have been big supporters of Cunneen. News Corp journalists have been very busy over the last few months demanding an inquiry into who has been leaking information from ICAC to Fairfax journalist Kate McClymont. I agree that we should have an inquiry and include Margaret Cunneen’s leaks to journalists. I wonder how keen News Corp journalists will be on that idea. The story is not going away anytime soon although News Corp journalists and others are working overtime to try to make sure it does. But it’s too late as the cat out of the bag now and we have former Supreme Court judge David Levine to thank for that. If you would like to follow this website you can by email notification which is at the top right of this page and about twice a week you will be notified when there is a new article. Margaret Cunneen is a sick & perverted individual who will bribe any journalist & radio presenter to believe her rotten lies. 2gb & News Corp have severely misled the NSW public in supporting Cunneen. It shows that the NSW legal fraternity is dirty & corrupt, Cunneen is one of the very worst of them. For a person like Cunneen to blame her problems on her sister shows what a sick person Margaret Cunneen is. 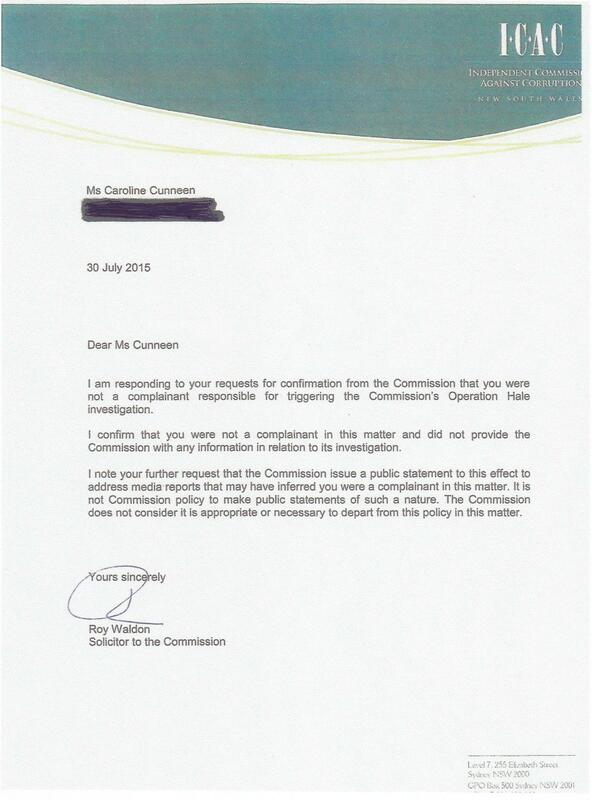 The ICAC investigation into Margaret Cunneen is completely justified. ICAC don’t just investigate people because they are fishing for people, they investigate people because they have committed criminal/corrupt acts in NSW. Cunneen’s reputation has been severely damaged over this, and it will never recover from it. The NSW DPP must sack Cunneen at once. As long as Cunneen stays as a crown prosecutor, the NSW DPP will be a laughing stock with absolutely zero credibility. Latham is no angel. It is not a matter of who should be sacked at ICAC. It is more a matter of the entire festering mess should be wound up and flushed back down the sewer most of them came from. And flush Triggs and the HRC with them, great company for each other. I’d suggest you’re part of the ‘whole festering mess’ for anyone, advocating ICAC be wound up, attacking Latham as “No angel” and not to mention Cunneen in any light, is to align themselves with those putrid mouthpieces, Jones & Hadley. NSW judiciary, the political scene is as rancid as the US congress. The long weary public are the true victims here, Australia is beginning to look like a sullied money pit of corruption and evil, if anything, supercharge ICAC’s powers and bring them all down, all these thieving leaners, start from scratch, this is a disgrace. To flush it all and continuing the status quo might suit those currently sweating bullets, but not us, the taxpayer! The Murdoch press and 2GB. What a perfect match. Always going off half cocked without knowing the facts. The know it alls of know it alls who know SFA. Wouldn’t it be nice if these clowns were investigated by ICAC and all their corrupt ways displayed for all to see. They must be a nervous bunch now this new bribery scandal has been exposed. Clearly we NEED a Royal Commission into the entire Rupert Murdoch system of business… but Julia Gillard disgustingly failed to act so does anyone expect his puppets the Lnp TO DO OTHERWISE? Why would Gillard act when Murdoch was one of her, and Rudd’s, biggest supporters? Doesn’t the ICAC-CUNNEEN issue come down to the High Court interpreting the word CORRUPTION differently to the ICAC’s interpretation?? Or could they be just frightened of what I believe legal experts refer to as “opening the flood gates”. Look around people- the gates are opening everywhere…you cannot hide from the truth. Support it now and build a better world.